Shearwater Marine Services has a well respected background supporting marine based infrastructure projects. 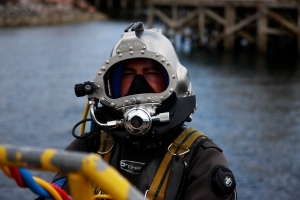 Our company has recognised pedigree from underwater inspection, maintenance and repair contracts to large scale, high profile, marine construction and decommissioning diving projects. We have high customer retention and an excellent reputation for providing invaluable and professional assistance to construction industries, renewable energy providers, the ministry of defence, local government agencies, utilities providers, ports and harbours authorities, consultant engineering firms and shipping and ferry companies. Typical projects include: Large scale construction, installation and demolition projects; concrete, steel and wooden inspections, repairs and replacement; video and photographic surveys; non-destructive inspections; cathodic protection systems design and installation; steel piling inspections, repairs and removal; underwater structural welding; anode installation; application of protective coatings; bridge inspections and repair; pier and slipway repairs; anti-scour protection; bag work repairs; shuttering repairs; dredging operations; bridge installations; inspections; maintenance and repair; drilling; engineering surveys; pressure grouting; steel cylindrical and sheet pile removal; waste water and sewerage pipeline outfall installation and protection.